The Spartan BTC Atomizer from Horizon is a 3.5ml and 1.5ml capacity clearomizer that will function with voltages between 3.0v-6.0v. This means that it will work with any eGo 510 threaded battery, including all variable voltage batteries we carry, and won't burn out the wicks as other clearomizers will on a higher voltage battery. It is a sturdy clearomizer with a polished look that is not only handsome to look at, but also functions at the top of its class. The Spartan BTC Atomizer is made of a durable combination of Pyrex glass and brass plated stainless steel. This makes for a durable atomizer that will give you long lasting satisfaction. 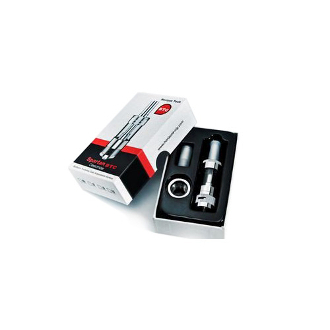 This great Atomizer also comes standard with an Airflow Valve. This allows you to adjust the amount of airflow you receive to customize your vaping experience. Most vapers use this feature to customize their atomizer to accommodate different types of liquids, along with different voltage settings. The Spartan has a bottom coil that has the capability of being replaced when it burns out. This gives you extended time with this atomizer and should allow you to use it over and over before needing to replace it. The coil itself has Japanese organic cotton wicks that are a new trend in the vaping world. Organic cotton is used because it allows for maximum saturation. Another amazing feature of this atomizer is the fact that you can fill it from either the top or the bottom. We recommend filling it from the bottom initially or when you've just changed the wicks to ensure that the cotton becomes completely saturated. After this, topping off your liquid supply from the top makes life easier. The beauty ring that is also included with this atomizer allows you to fill in the gap between the atomizer and the top of the battery. Not only does this help to give your e-cigarette setup a more seamless appearance, it also helps to protect from breaks. Please keep in mind that though it does help prevent breaks, it is not a cure-all and you should still try to eliminate drops and bends to further prevent damage. Hold the tank upside down with the drip tip facing down. Fill with e-liquid by tilting the tank at a slight angle and dripping juice down the inside wall against the outer wall of the glass tank. *You may also fill by unscrewing the top. **Do not allow e-liquid into the center tube as it will leak out the bottom of clearomizer. *Wicks have an average lifespan between 10 to 20 days and is dependent of the amount of vaping. When the wicks wear down, it may begin to leak and can/will taste burnt.